Kenny and Angie are renowned for their necklaces of handmade beads, carefully prepared nuggets and shell beads. They make some of the very finest handmade beads of all the artisans at Santo Domingo Pueblo. While Kenny makes the beads, Angie does the stringing. The best necklaces are made with the best beads, but they must also be well strung and that is the magic of their partnership. 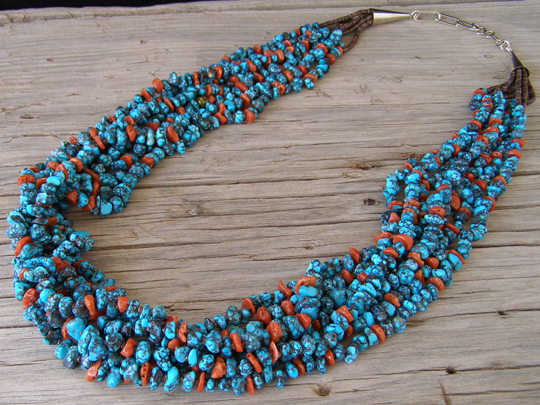 This seven strand necklace is a true rarity because it is strung with natural, untreated nuggets of black web Morenci turquoise in combination with red coral beads. This turquoise is hard enough to be drilled without fracturing, in spite of the fact that it is not hardened by stabilization. The fine blue color with black spiderweb matrix is gorgeous and perfectly complemented by the red coral beads. Angie used fine-diameter baby olive shell heishi as spacer beads throughout the strands and finished her strands with short runs of this heishi at the Sterling cones. Impeccable in every way; never to be repeated.